There’s always too much month left at the end of the money, isn’t there? You can try your best to make your pennies stretch, but sometimes you just can’t make it. That’s to be expected from time to time. It happens to the best of us at some point. Fortunately, the excellent Zen Habits is back with 20 simple, painless money hacks that you can do to help stretch that cash just a little bit farther without actually noticing the extra pinch. Best of all, the advice? Totally free. You don’t even have to leave a gratuity or buy Matthew Lesko’s book. 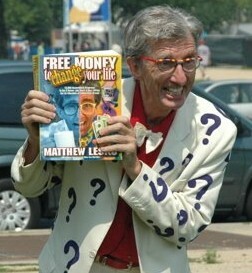 Matthew Lesko is that crazy guy you see on TV selling books on how to take advantage of government grants and whatnot. The loud guy in the suit covered in question marks. A lot of these tips I do myself. For example, my IRA is taken out of my check pretax. My money is directly deposited into my account. I pay my credit cards and whatnot online where possible to avoid buying stamps and wasting time. I have separate accounts for various things to track what I spend money on (one credit card for gas, one for online purchases, one for groceries and food). I try not to buy food or drinks on rare occasions I go out, and I drink coffee at home or from the gas station rather than swinging by the Starbucks. The one thing I deviate on from this list is that where Leo swears off the plastic, I have several credit cards and rarely, if ever, carry cash. If I want paper money, I have to go to the bank and get it, because otherwise it’ll be spent on dumb things like food and drinks that I don’t really need. When I pull out the credit card, I always think twice about whether or not I want to bother with whatever it is I’m getting. Paying at the gas pump allows me to avoid going inside the den of candy temptation that is the gas station mini-mart. Money flows like water, but the process of waiting for and signing a receipt to get a bottle of soda is enough to make me not do it, thus saving $1.50 or more on every jaunt to the BP station.